Last month I made pot stickers for the first time and I have to say, I was V impressed with them. 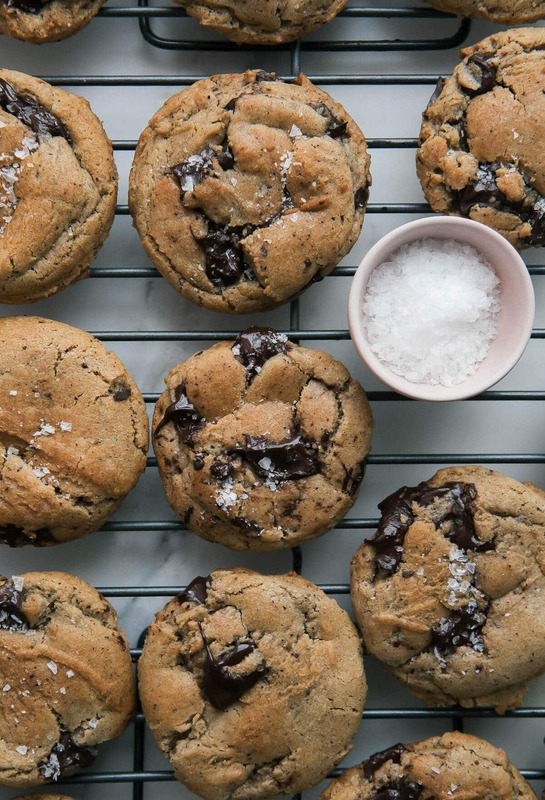 They’re now one of my favorite things to make at home and are a million times easier than I thought they were. And yes, most of that has to do with the fact that I don’t make my own dough for the wrappers; even though that also doesn’t seem that hard to make, so maybe next time I’ll give it a try. There were some days last week that felt like summer but I refuse to let go of spring for a long time. So we’re still in full effect with spring on this here blog for a long time. These are filled with mashed peas (and some whole peas). 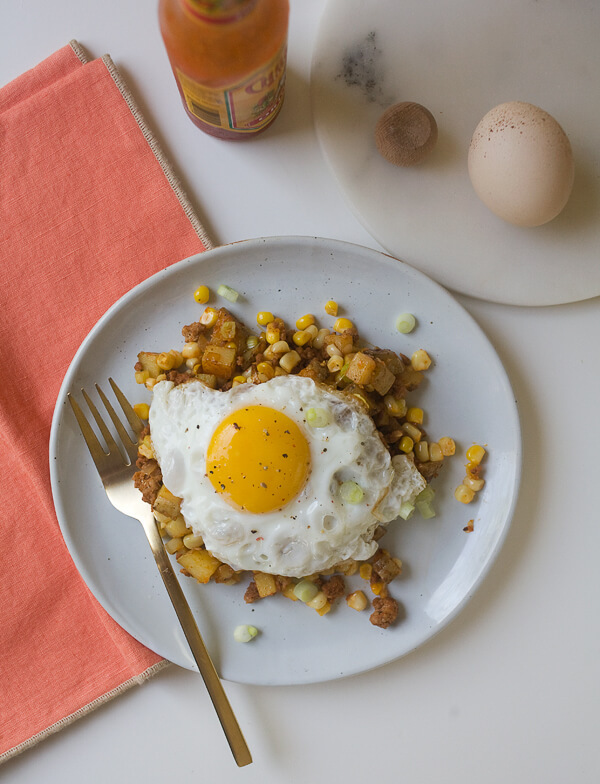 The addition of sautéed buttery leeks also adds a nice flavor note. These are SO good. I love them so much. The flavor here is all about sautéed leeks and barely cooked peas. 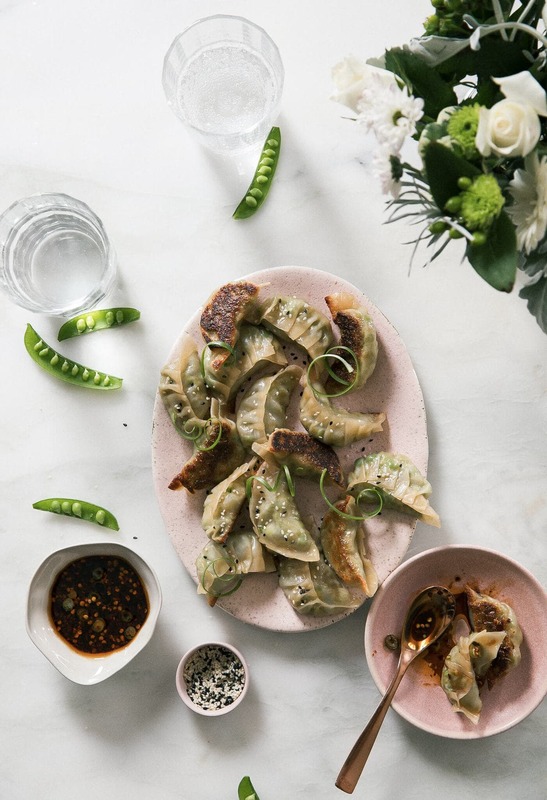 The inspiration behind these pot stickers comes from Lisa Lin’s Instagram. Do you follow her? Her food looks so good. I could stare at it all day long. My favorite part about making pot stickers is the part where you add a bit of water to very hot pan and then immediately cover it with a lid. And it gets all steamy and gorgeous. This dipping sauce is pretty spicy and I’m in love with it. Feel free to scale the crushed red pepper a bit. Add less if you’re into moderately spicy and add a full teaspoon if you like that fire! Obviously I chose that fire and went full teaspoon! In a blender or food processor, add 1 cup of peas and 1 teaspoon of sesame oil. Blend until mostly smooth. A chunky mixture is good! It’s not supposed to be totally smooth. Set aside. In a medium skillet, set over medium-low heat, add the butter. When melted, add the leeks, a liberal pinch of salt and a few rounds of black pepper. Cook until the leeks are soft, stirring regularly, about 10 minutes. Add the soy sauce, minced garlic, and grated ginger and cook for 1 minute more, until the garlic is fragrant. Add the reserved mashed peas and whole peas. Give it a good mix and transfer to a bowl. 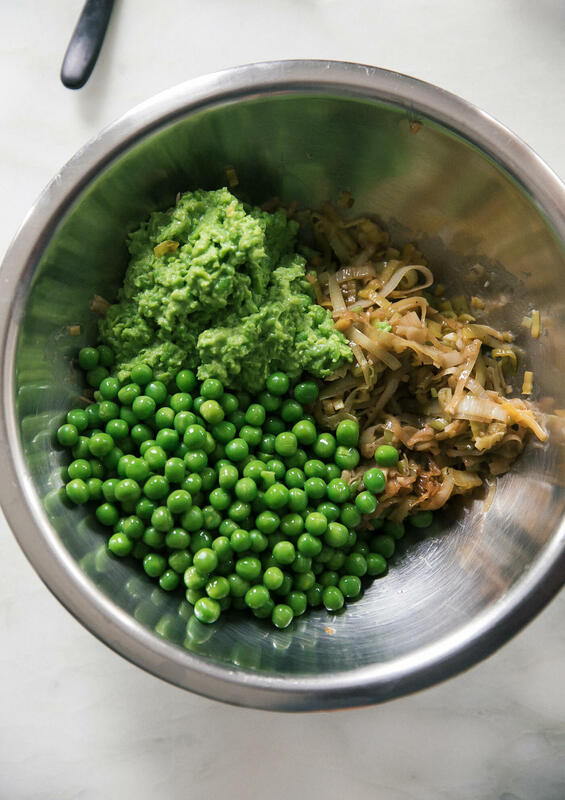 We’re not really cooking the peas a whole lot—we want that fresh flavor! Give it a taste and adjust the salt, if you like. In a small bowl, add the crushed red pepper. In a small bowl or small warming pot, add the sesame oil. Heat until very warm, but not scalding. 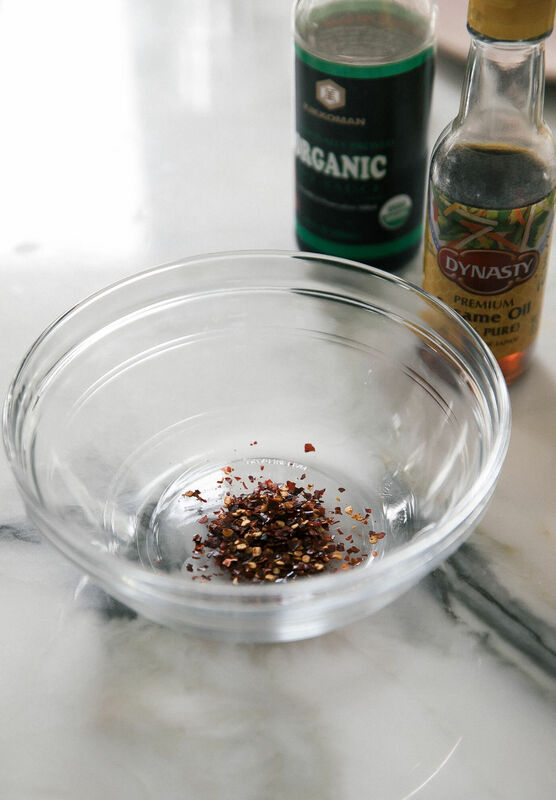 Pour the sesame oil over the crushed red pepper and allow to steep for 5 minutes. Next, whisk in the soy sauce, rice wine vinegar and add the thinly sliced green onions. Place one wrapper in your hand. Add a teaspoon of filling to the center of the wrapper and moisten hallway around the edge with a wet finger. To seal, using the thumb and forefinger of one hand, form tiny pleats, pressing the edges together. Stand the dumpling up on a baking sheet. Repeat with the remaining pot stickers. I always admire this kind of recipe. As i am vegan this recipe inspired me very much and i am definitely going to share this with my friends and family member. How much Sriracha? It wasn’t in the sauce ingredients? 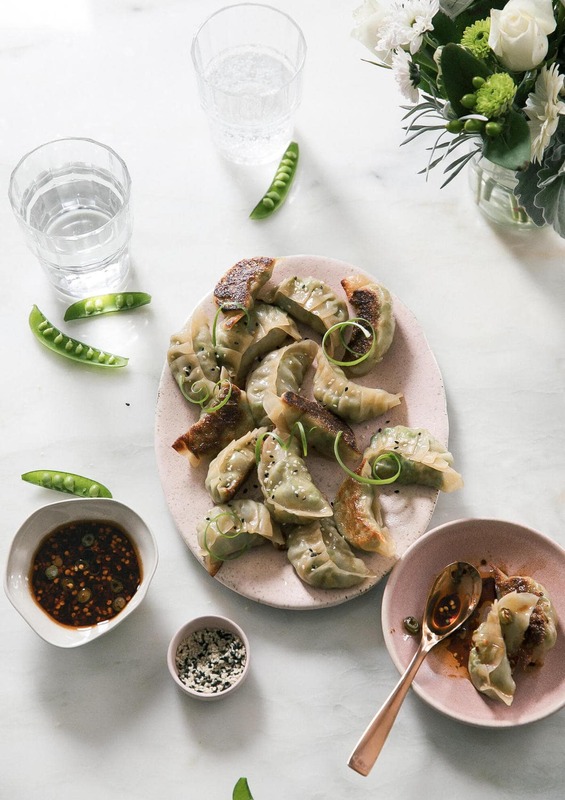 How many dumpling wrappers did you need/does this recipe call for? all fixed now–sorry about that! 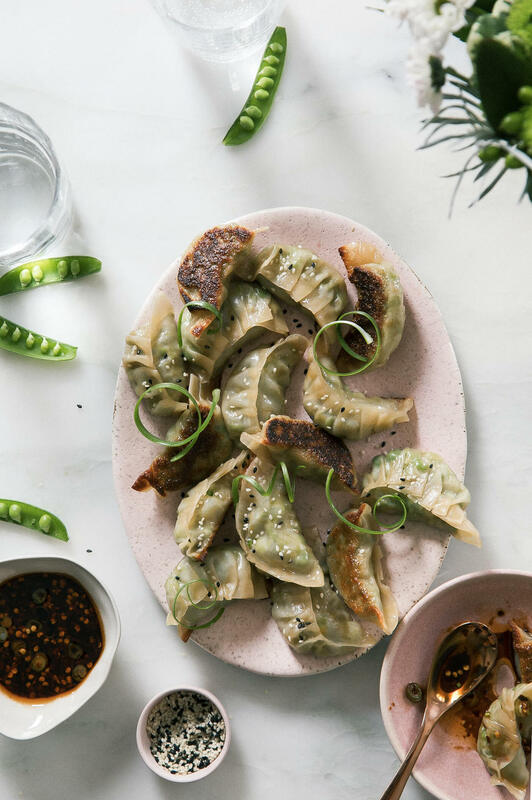 these pot stickers look amazing 🙂 you’re so crazy talented Adrianna! thanks, aimee. you’re so sweet! This is the video I watched over and over to help me figure out the pleats! 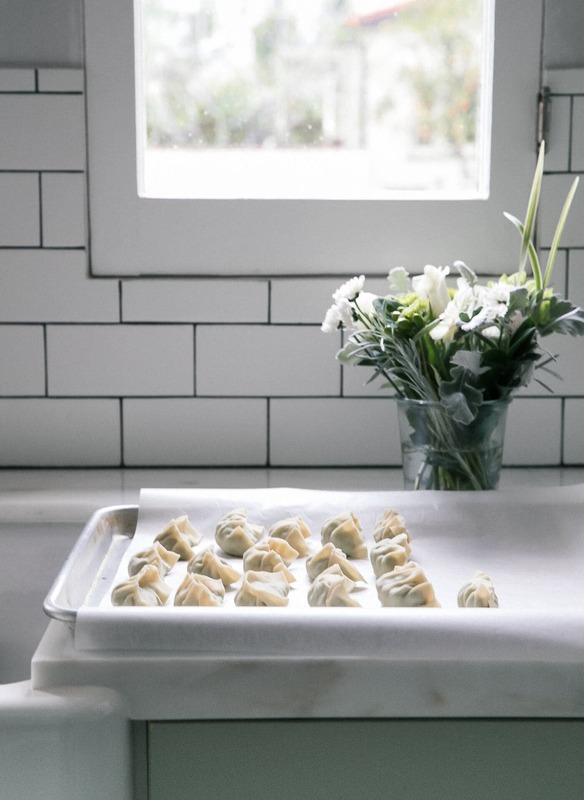 My husband and I spend a Saturday morning every few months making up batches similar to these to freeze (I use edamame and leek, he adds chicken) The best investment I ever made was a dumpling press. It cost like $3 at the Asian grocer and makes perfect pleats as well as halves the time. Added bonus, I also use it for empanadas. Ooooo that sounds so good! 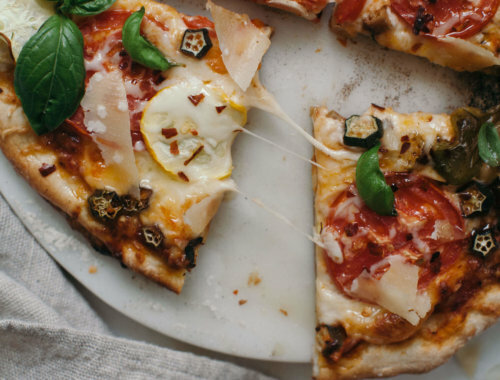 As a person who’s allergic to leeks what would you say is a good alternative to them In this recipe ? are you allergic to all onions? green onions would work too! First day with kids back at school, so I picked a fun kitchen project for myself! Everyone LOVED these! I used the square wrappers and wasn’t sure if I should flip them to crisp on both sides? Such a success and very zen for me. Thank you!